The aurora borealis is caused by particles from the sun blowing toward the earth with the solar wind. When these particles hit the earth's magnetic field, the crash of atoms and molecules creates a beautiful sight. Of all the billions and billions of stars in the Universe, only one small and fairly unremarkable star really matters to us: the star without which life would be very different on Earth -- our star, the Sun. One of the most puzzling features of the Sun is what has been dubbed "the solar corona problem." There is a region around the Sun, extending more than one million kilometers from its surface, where the temperature can reach more than a million degrees. This region, called the solar corona, is where the solar wind originates. The corona has been found to emit X-ray radiation (the corona is a plasma; at temperatures greater than a million degrees a plasma will radiate a lot of X-rays). 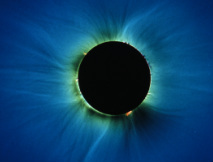 The corona can be seen only during solar eclipses, when the main radiation from the Sun's surface is blocked by the passage of the Moon or with special instruments. The problem is, no one can really explain how this corona exists. Even if the temperature in the core of the Sun does reach 15 million degrees, it drops to a mere 5000 degrees at the surface. The temperature should be even lower farther away from the Sun, but the temperature of the corona is measured at more than a million degrees. This incredibly hot temperature requires a permanent heating mechanism, or the plasma would cool down in about an hour. There are many mechanisms which could heat some gas above the surface of the Sun, but none of those mechanisms could account for the large rate of heating necessary to heat the corona to these temperatures. This phenomenon remained a mystery for more than 50 years. magnetic polarity and the light regions are negative magnetic polarity.